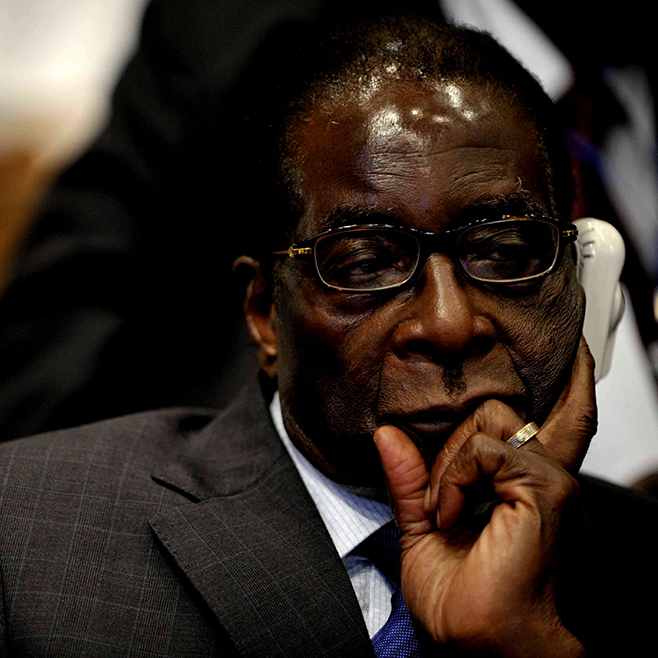 ZIMBABWE – Succession politics in Zanu-PF is taking an interesting twist with many in the party now determined to see President Robert Mugabe’s back, albeit for different reasons. While the general card carrying member is reeling under the economic effects of Mugabe’s misrule and therefore wishing the 91-year-old leader calls it quits in anticipation of a new breath in State House and a serious economic turnaround, political opportunists and dexterous but callous secessionists want Mugabe’s demise sooner rather than later because if he were to leave office now, two-and-half years before the end of his current term, there are chances that unelectable candidates can get the presidency by manipulating the voting system at the extraordinary Zanu-PF congress that would follow Mugabe’s exit before expiry of his term. There are very interesting scenarios, especially with the current two vice presidents. It is a fact that Zimbabwean politics is littered with many tribal connections, considerations and affiliations to an extent that it is very difficult for someone coming from a minority group to amass a popular vote especially when voters do not look at what the individual brings on the table but consider where he was born. Such a scenario is an Achilles heel on the part of Vice President Phelekezela Mphoko who comes from the minority Ndebele tribe. The fact that Mphoko is Ndebele, in a country where politics is highly tribal, means that he has to do more to transcend tribal political barriers and appeal to the Zezuru, Korekore, Manyika and Karanga, if he were to win a general election and the tribalistic nature of our politics coupled with Mphoko’s relative unknown political history, makes it a tall order for him to represent and win the presidency for Zanu-PF in 2018. With the other Vice President, Emmerson Mnangagwa, the Gukurahundi atrocities in the early 1980s in Bulawayo, Matabeleland North and South and Midlands provinces are an albatross that makes it very difficult for him to win a general election. In fact Mnangagwa has a very poor electoral history that he has lost elections to virtually unknown opponents and to think he can outsmart people like former Vice President Joice Mujuru or Morgan Tsvangirai in a presidential election is expecting too much from a man who is as unconvincing rhetorically as he is in terms of vision and content. The political handicaps I have mentioned earlier affecting the two vice presidents bring a new dimension and urgency to the succession matrix in Zanu-PF especially as Mugabe continues in office. With both candidates that are touted as possible replacements for Mugabe suffering serious political haemorrhages that make them unfit to succeed the current president through a general election, the best bet for the two is to slug it out at an extraordinary congress within Zanu-PF where less than 12 000 delegates would elect a president of the party and government in the event the incumbent does not finish his current term. The fact that between Mnangagwa and Mphoko, no one fancies his chances in a general election means the best thing for them is for Mugabe to leave office now and this is the reason why there is so much talk about Mugabe leaving office, either due to incapacitation or death and for this reason it is very difficult to imagine the two do not wish bad for their boss. In the likely event that Mugabe leaves offices before the turn of his term, there is one significant player in the succession matrix that the two candidates would battle to rope in and this is none other than Jonathan Moyo, the minister of Higher and Tertiary Education. Moyo brings in the thinking component that both Mnangagwa and Mphoko badly need in their respective corners and he who manages to persuade Moyo, most probably by being the best bidder for his cognitive capabilities, would have a head start in the race for State House should an extraordinary congress be needed to replace Mugabe. Moyo can be useful in message production, strategic planning, manipulation of voters and execution of whatever methods he would have devised to land the presidency but this does not come cheap. So anyone with Moyo on his side would know their chances are bright since he can be used for his skulduggery and for employing barbaric methods to attack political opponents. Moyo brings to the table control of the state media. Although he is no longer minister of Information and Broadcasting Services, Moyo has done a lot in terms of appointing his proxies to an extent that even now reports coming out the state media indicate that he still plants stories and has a controlling stake in the hearts of the editor he appointed during his short-lived second coming. With Moyo’s blue-eyed boys government controlled media, he remains a very potent factor if he chooses to use these media channels to market a candidate or alternatively rubbish one. On the other hand, with the infamous Information and Media Panel of Inquiry (Impi), Moyo bought himself into the hearts of many independent media editors who benefitted immensely from the outrageous allowances that Moyo initially threw at them although the purse dried up towards the end. The effect of Impi, however, is that Moyo managed to repair the damage he had caused during his first tenure as information minister where he championed the enactment of the Access to Information and Protection of Privacy Act (Aippa) which led to unprecedented harassment of journalists and closure of some publications. The Impi project managed, to some extent, to cleanse Moyo from the demons of his past in the eyes of the many media practitioners who benefitted monetarily from the exercise. If there was any positive that came out of the Impi project for Moyo, it was the restoration of communication between him and his erstwhile acquaintances in the media, itself an important development for him in case he would want to rope them in during the run-up to the extraordinary congress following Mugabe’s departure should it happen. With two unelectable candidates fronting the race to succeed Mugabe, it seems Moyo is a man in demand and therefore at the centre of the succession battles within Zanu-PF. While First Lady Grace Mugabe provides an interesting sideshow to the main battles to succeed her husband, it might be true that Moyo is behind the First Lady’s involvement in the succession matrix, not as a potential successor, but as an instrument to muddy the waters so that catfish-like politicians, the likes of Moyo, can thrive. As Moyo and his G40 group did during the campaign to oust Mujuru, the same group seems to be using the garrulous First Lady to take occasional pot shots at Mnangagwa whom Moyo, in the absence of Mujuru, sees as the real threat to the ambitions of his preferred candidate. The perfect chance for any candidate from the minority Ndebele tribe to succeed Mugabe is if he were to leave office before the expiry of his term and this window of opportunity is not lost on Moyo and the events after Mugabe leaves office would show that prior planning had been done to prepare someone, relatively unknown, to replace him. With voting restricted to less than 12 000 Zanu-PF delegates, it is not lost on Moyo and his preferred candidate that such a number is easy to manipulate and events during the Zanu-PF youth congress last year show that incentives can change hands before voting at such elective meetings. The election of the Speaker of Parliament in 2012 is instructive. It is now likely, more than ever, that a person from a minority group in Zimbabwe can become president and Moyo might be his deputy.